Hiking enthusiasts, the Chic-Chocs are your destination! 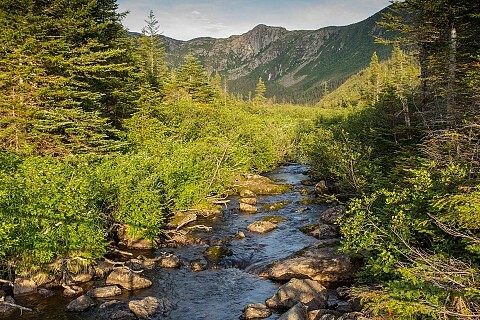 Contained in the range of the Parc national de la Gaspésie, there are more than 25 summits exceeding 1,000 m, including the famous Mont Albert and Mont Jacques-Cartier. From the peaks, one can observe the tundra-type vegetation and, with any luck, see caribou from the only herd south of the St. Lawrence. You don't need to be an experienced hiker to enjoy the Chic-Chocs. The park offers a wide range of trails, from a 30-minute stroll to a hike of several days. Moose, lakes, waterfalls and spectacular viewpoints will dazzle the whole family, including interpretation and discovery activities, camping, canoeing, etc. The Chic-Chocs are also an amazing playground for canyoning, fishing, hang gliding, camping, rafting and so much more! Put on your hiking boots and explore the Chic-Chocs, the largest playground in Québec! Click on the heart to bookmark activities, to help you plan your stay.